In his book Reinventing Comics, comics theorist and cartoon character Scott McCloud holds up a North American comic book magazine and proclaims that “this is not a comic,” followed by a panel in which he opens up the comic to the pages within, “this is.” This began a short sequence in a chapter that focused on the downturning Direct Market of North American comic books and how the industry can bring new readers in. McCloud believes–as I do–that the most important aspect to comics culture is awareness. He stands in a camp of thought that says that if only one could show people the things, more people would be excited about comics. This short sequence of the book goes on to suppose that if the comic book cover is not in itself a comic, then it is a barrier to comics awareness. Therefore, if we could put the sequential art directly at the forefront and show people exactly what comics look like on the inside, more people would go into the stores. McCloud throws out something that is clearly a futurist suggestion–a window display for comic shops that features blown up comic pages in a large mechanical display. This display would allow passersby to turn the pages with controls from the outside. They’d have the pages right in front of them. In this way, McCloud suggests, the direct experience of comics/sequential-art would be placed before the eyes of the average person walking by. This was the earnest beginning of my cartooning career. In the months that followed, the idea implanted itself deeper and deeper in my mind. When I started to truly make comics, I imagined them as one-page strips. The cultural and commercial appeal in my mind was to make “poster comics.” And I knew that there had been such things in the past. But my desire was to make them “a thing,” how do you say…a vital genre in the sequential art medium. Related to traditional comic strips and traditional one-page comics, but altered through context. Normal one-page comics are read in newspapers or books. A comic the size of a rock poster would be originally intended for a person’s wall. As such, even though the shape is similar, the intent is different. 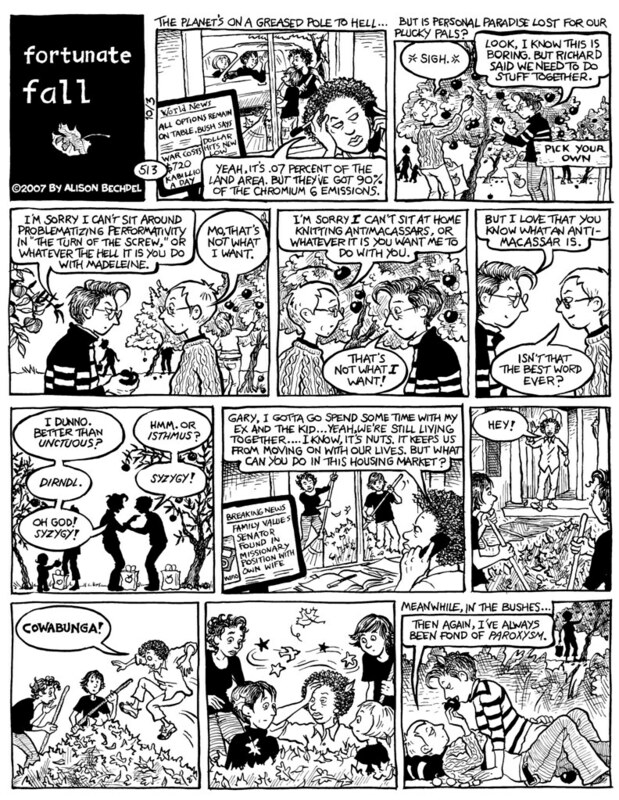 For example: a one-page comic like Alison Bechdel’s Dykes to Watch Out For (one of my favorite comics of all time) is easy and fun to read on an alternative newspaper page, on the computer screen of Bechdel’s blog and in collection books like Houghton Mifflin Harcour’s 2008 The Essential Dykes to Watch Out For. However, the visual style of Dykes to Watch Out For is actually unsuitable to be read from a few feet away, even if the art is enlarged to make each strip poster-sized. The panels are compact, intimate; the content wordy. At some points, Bechdel seems to suffer from horror vaccui (the fear of negative space). I say this with great love for Bechdel and other horror vaccui artists. I love the stuff, but it must be read up-close, on a page of paper, not at standing distance on a friend’s wall. No. For that, you’d need to look at a cartoonist who came along a few years later: Aaron Diaz of Dresden Codak. I first met Diaz in 2007 at Small Press Expo. I met him very shortly after encountering Dresden Codak online. I wasn’t too into webcomics at the time; I found them difficult to keep up with. But I enjoyed seeing new work that I could investigate at places like SPX. At this time, Diaz hadn’t printed any books yet; he was selling twenty dollar Dresden Codak print-posters. I believe that I told him at the time how happy I was to see him doing these poster-strips because they were a thing that I felt was vital and necessary. I bought one of the posters as well. Unfortunately, by 2007, I had moved on in my own work past one-page strips and toward multi-page short stories and more prominently, my one-panel nonhumor vignettes, Little Garden as well as a couple of lesser works. As much as I love Little Garden, I have always had a yearning in the pit of my stomach to do bold large poster comics. With large, spacious panels that a person could fall into. I keep attempting but I always fall short, in part because so much of my cartooning skillset has grown accustomed to the single-panel format. Meanwhile, I’ve been forced to clench my teeth with bitter regret each time a person mentioned to me that my work would “make great prints.” But writing this article has been personally enlightening. I will consider a life change. Comic posters… What an awesome idea! Along with all of the creative possibilities for artists, existing comics could benefit from this idea greatly. I can think of a few single pages of my favorite comics that would make great wall art. Hell, it might even be great to see some longer sequences in comics adapted into a one-page poster. One example might be in Astonishing X-Men 6, where Colossus tosses Wolverine into the air to catch a spaceship lifting off – the classic “fastball special”. It may take both pages to fully explain the sequence, but you could edit the artwork pretty easily to make it work as a poster. Sure, you’re editing the original art, but it can’t be any worse than the motion comics adaptation, can it? I don’t know how that happened; I am in the habit of linking webcomics when I discuss them. I may have saved the wrong version of this post. I’ll correct the error tonight on my real computer if the iPhone doesn’t permit me to add jump-links.